Statistics can be a bit of a struggle in the health and safety world. How many work-related injuries or illnesses are really happening in an industry, a city, a province? What are the definitions? Workplace health and safety falls under provincial jurisdiction, except in federally-regulated industries, and different regions track injuries and illnesses in different ways. Companies argue with themselves about setting numerical targets to reduce injuries: on one hand, is “zero” realistic? But on the other hand, shouldn’t the goal always be zero? For us at Threads of Life, the only statistic we’re really comfortable with is: one. Whether it’s a devastating back injury, a limb lost, a diagnosis of mesothelioma or PTSD, or a death, that “one” is the worst thing that could happen to that family. It’s a tragedy. The impact of that “one” touches many and lasts a lifetime. Vicki’s husband Kevin had worked for the same contractor for 25 years. On March 10, 2011, an excavator was being used to load a large steel plate onto his work truck. When the plate collided with a metal post, Kevin, the driver of the truck, was struck in the head by the post and killed instantly. Katie’s son Bryan was a train conductor. On a snowy afternoon, he and the train engineer were asked to do a routine switch of a diesel tank for the camp generator at a small station on the side of the rail line. Bryan’s job was to set the switch for the derailer so the engineer could bring the car in. Neither he nor the engineer was aware that there was a second derailer that needed to be de-activated. The fuel car that Bryan was riding on derailed and rolled. Bryan died instantly. Shannon’s father Peter was a licensed mechanic. On September 20, 2013 he was working out in the yard without a hoist, removing a gas tank from underneath a van. The vehicle caught fire and exploded. A co-worker pulled him out from under the van. Peter suffered severe burns to 95 per cent of his body and died in hospital the following day. On January 19, 2006, Johanna’s son Micheal, who had a reputation as a conscientious and safe worker who always wore his safety gear, ran up a ladder ‘for a minute’ to a three-story roof. For some reason that day he was not wearing his gear. There had been icy rain conditions the night before. He fell, sustaining a traumatic head injury and died six days later. Jim’s son Jim Jr. followed his dad into a career as a licensed elevator mechanic. Jim died when an elevator platform rammed into the top of the elevator shaft he was working on. The weight compensation on the elevator was too heavy and pulled the elevator platform up at freefall speed. Jim succumbed to his injuries on March 30, 2005. 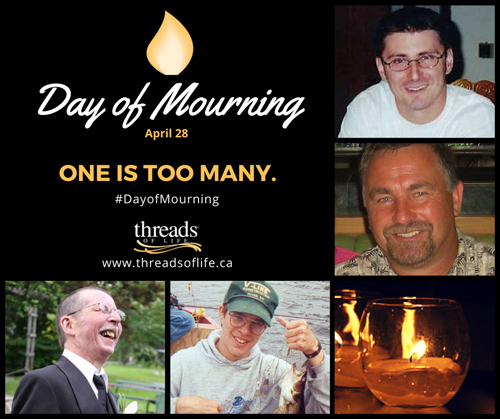 There will be other Threads of Life speakers at microphones in ceremonies across the country, and Threads of Life family members in the audience on Day of Mourning. And there will be friends and co-workers, and relatives and neighbours, all remembering their “one”. To join them, look for a ceremony near you – or light a candle in your window to honour all the stories behind the statistics. Even one is too many. Susan Haldane manages marketing and communications for Threads of Life. Her background is in journalism, public relations and health and safety.